William was born in Newbury on 19 June 1881 the son of Edward Crook and his wife Hannah Maria (née Coxhead). He had a number of siblings, including several half-siblings born to Hannah in a previous relationship or relationships – Eliza Coxhead (born 1858), Frederick James Coxhead (1861), Louisa Ann Coxhead (1864), and Elizabeth Coxhead (1867). Another illegitimate child, Edward, was born on 28 March 1872. Sadly he died very soon after (8 April). Given his birth close to Edward and Hannah’s marriage in 1872 it seems quite likely that he was Edward’s child (the name being another suggestion of this). The couple then had three further children, Mary Maria (born 1875), Ellen Georgina (1878) and William. Census returns show that the Crooks did not settle for long in any one address – Mary and Ellen were born in Upper Wootton between Kingsclere and Basingstoke; they then moved back to Newbury and can be found at Rose & Thistle Yard (1881), 5 Herborough Place (1891), 3 Bartholomew Almshouses, St John’s Court, Argyle Road (1901). More addresses can be seen in school records where Mary is from Northcroft Lane (1883 – this could be the Rose & Thistle Yard address), Ellen from Mayor’s Lane (1887) and William from St Mary’s Cottages (1889). William was educated in Newbury, first at the West Street infants’ school and then at the British School which he would have left at the age of twelve or thirteen. These sparse facts about his schooling are only known because they are recorded in the records of St Nicolas’ National School – which he attended for one day, 22 March 1889. By 1901 William’s elderly parents had moved into a tiny one up, one down almshouse (his father was considerably older than his mother). They were simply unable to provide accommodation for William who went to live with his sister Elizabeth and her husband, Edmund Barlow. Both of his parents spent periods in the Newbury Workhouse - indicative of poverty (they certainly weren’t a well to do family) or of sickness (the workhouse infirmary was the only option for many poor folk in need of hospitalisation). 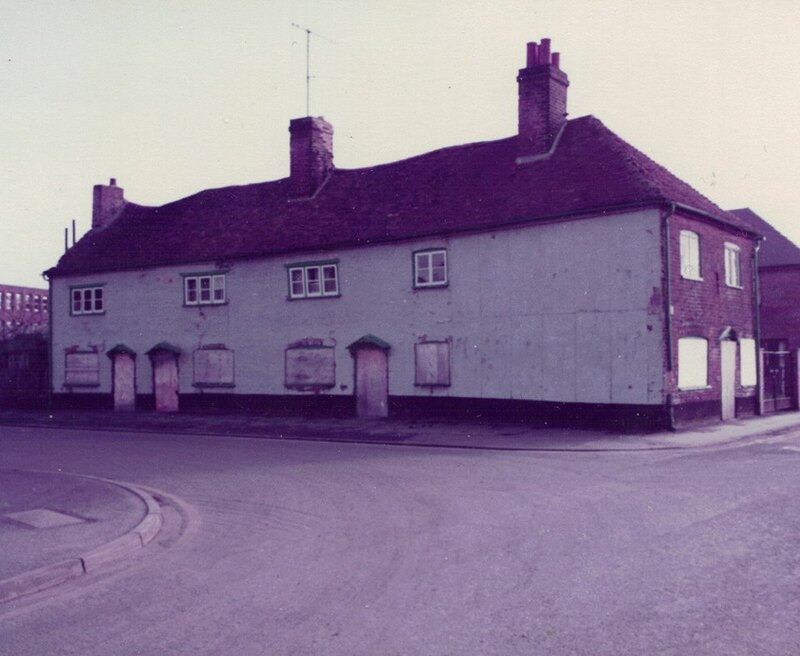 What were known as Diamond Cottages in William's time - shortly before they were demolished. The one fronting on to Northcroft Lane was probably No 1, he was in No 3. In his time there was a narrow alley between these cottages and another block of four, which were demolished to enable West Street to be extended to meet Northcroft Lane. On 3 December 1904 William married Annie Althea Sarah Povey and the couple settled into a terraced cottage in Northcroft Lane. On 3 October 1905 their first child Annie Ethel Althea was born followed in 1909 by Winifred Nellie, who died the following year just over a year old. Infant deaths were commonplace at this time, nevertheless each such death was a tragedy for the family concerned. William and Annie had three more children: Daisy Florence Gwendoline (born 27 September 1910), William Frederick John (10 January 1913) and Leslie Edward Francis (15 December 1915). Leslie was the only one not born in Newbury his birth in Willesden was the result of a move to North London for work. Their full address was 39 Greyhound Road, Kensal Rise, Willesden. Between 1906 and 1913 William served with the Berkshire Yeomanry, the part-time cavalry volunteer regiment that was integrated into the new Territorial Force in 1908. William may have considered extending his service (he left when his term of service expired) but, as work was taking him away from Berkshire it would be inconvenient to continue with the Berkshire Yeomanry and starting again in a new unit probably didn’t appeal to him. William worked for the Great Western Railway as a platelayer/packer first in Newbury and then in London. This was important work (track maintenance) in a vital industry and the loss of manpower in positions like this became a problem as hundreds of thousands of young men volunteered for the army and navy in late 1914. The Government introduced rules that meant that further would-be volunteers working in key industries had to get their employers permission before they could enlist into the army. William sought such permission which was granted on 10 April 1915. On 16 April William enlisted into the Royal Engineers. As Hannah was 44 years old at this time and hadn’t had a child for eight years there is a suspicion that William may actually have been the son of one of her daughters 17 year old Louisa or 14 year old Elizabeth. A suspicion reinforced when William went to live with Elizabeth and her husband, Edmund Barlow. However, this was when William was a teenager and his elderly parents had moved into a tiny one up, one down almshouse (his father was considerably older than his mother). They were simply unable to provide accommodation for William. Both of his parents spent periods in the Newbury Workhouse - indicative of poverty (they certainly weren’t a well to do family) or of sickness (the workhouse infirmary was the only option for many poor folk in need of hospitalisation). ries had to get their employers permission before they could enlist into the army. William sought such permission which was granted on 10 April 1915. 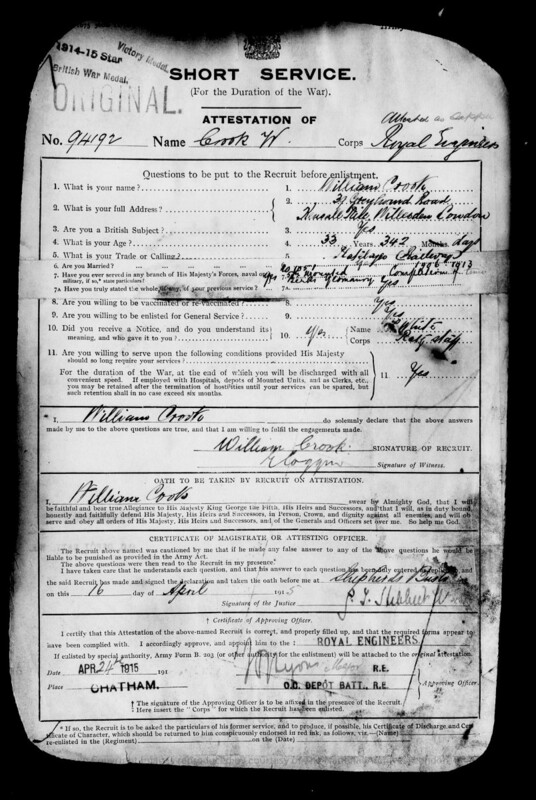 On 16 April William enlisted into the Royal Engineers. [Although the Royal Engineers would have a big role in the provision of light railways and enhancements to the French rail network this was, perhaps, not so apparent in early 1915 – nevertheless William’s railway experience was not ignored and his proficiency as a platelayer was immediately recognised and recorded on his record. 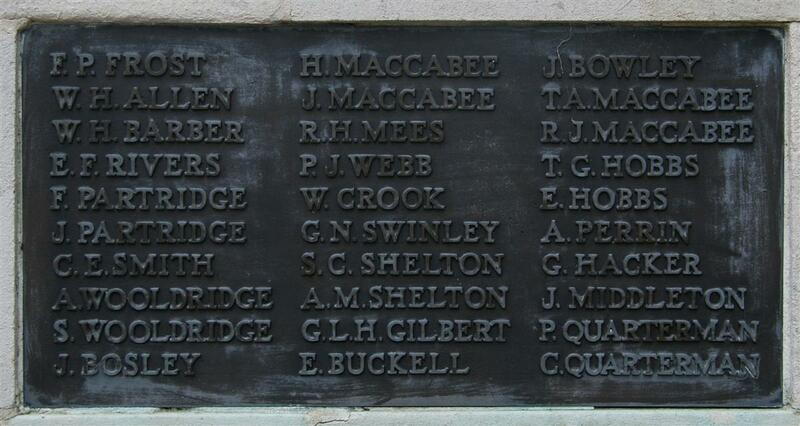 Nevertheless he was posted to the 128th Field Company, Royal Engineers a week later (23 April). This was one of several such companies attached to the 23rd Division to provide engineering support (usually to do with supply routes and trenches within the Division’s area of the front). While the company might find the need to maintain the light railways that were increasingly used to bridge the gap between the main railways and the line, they would rarely need to call on a platelayer’s specialist services. The Company went overseas on in August 1915; William landed at Boulogne on 27 August. 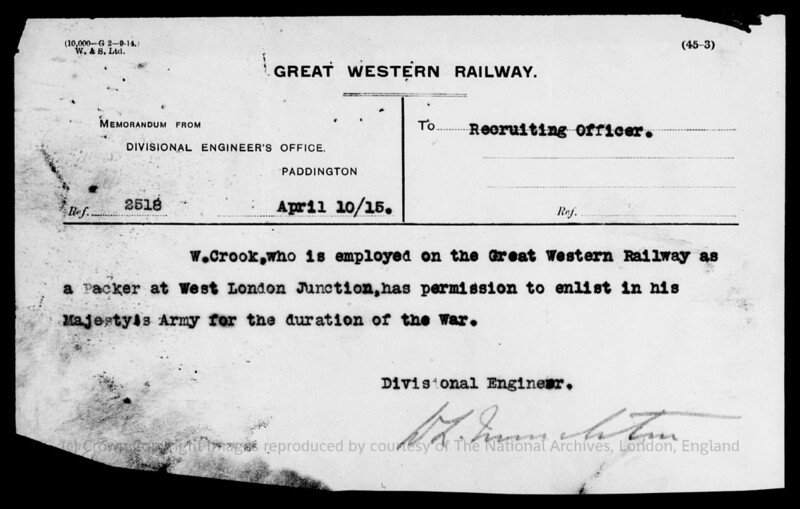 A year later, on 30 September 1916 William was awarded a pay rise in recognition of his proficiency in the engineering tasks the Company undertook. He got a week’s leave over Christmas 1916 returning to his unit on 2 January 1917. In March he was promoted to Lance Corporal. In June 1917 the British Second Army opened the 3rd Battle of Ypres with a successful assault on the Messines Ridge. 23rd Division was a part of X Corps which, with XI Corps an II ANZAC Corps made up Second Army. Once the German positions had been overrun there was plenty of work for the Engineers. SPOIL BANK: No 3 Section working on Xth Corps road. No 2 & 4 Sections with attached infantry & working party digging new support line behind RIGHT BATTALION front. No 1 Section on LEFT BATTN communication, reclaiming IMAGE ROW. . . . The Company was involved in the digging of new trenches (a trench ‘line’ actually consisted of three lines of trench interconnected by communications trenches – these held the front line garrison, support and reserve troops. Having captured territory the first thing troops would do is dig in and wait for the enemy to counterattack. If they managed to hold off the counterattack they would steadily improve their position into a proper trench and others (such as the Engineers) would create the necessary lines behind them – eventually forming a comprehensive trench system integrated into the lines to either side. Often trenches would be destroyed by shellfire – but could be ‘reclaimed’ or restored with a lot of spadework and construction of revetments, dugouts etc. 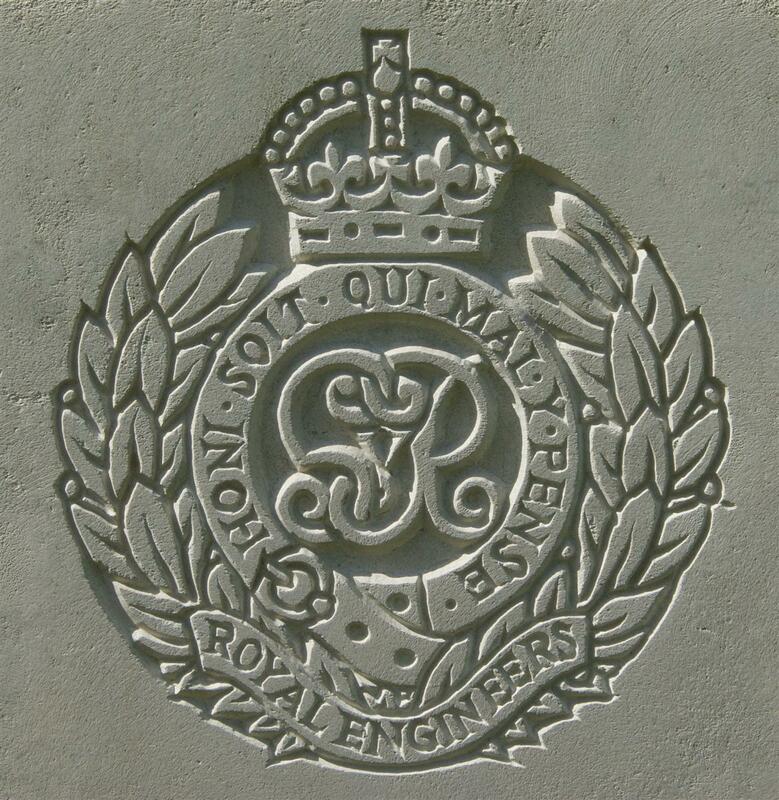 Infantry working parties would do most of the spadework while engineers would be responsible for construction activities.
. . . Corpl G SIMMONS, L/Cpl W CROOK & Sapper WOOTON killed. Sappers F WILLIAMS, D FLANAGAN & T HADDON wounded. Sapper T W SMITH reported missing since traced at WOODCOTE HOUSE AMBULANCE dead. It is actually unusual for the death or wounding of an ‘other rank’ to be mentioned in a war diary, smaller units like Engineer Field Companies were far more likely to include such personal items. However, the date is at odds with the official record of William’s death which attributes it to 2 July. This may well be explained by the fact that most of the work was carried out at night – in daylight it would be suicidal. The war diary may well cover the night of 1/2 July. CROOK – July 1st, 1917, somewhere in France, Lance Corp 94,192 William Crook, Royal Engineers, 128 Field Company, the beloved husband of Annie Crook, late of Northcroft Lane, and youngest son of the late Mr and Mrs Crook, of Argyle Road, Newbury, age 37. But in a hero’s grave he lies. From his sorrowing wife and four children. In loving memory of a dear husband and father, Lance-Corpl, William Crook, 74,192, 128 Field Company, Royal Engineers, killed in action at Ypres, July 2nd, 1917, aged 36. With love so true and strong. Though you’re silent in the grave. He gave his life, I gave my all. William’s body has no known burial place – this could indicate that he was the victim of a direct hit from a high explosive shell – when there would be no body left to bury, or it could simply be that he was buried at the time but subsequent fighting disrupted the land so much that he was not found during the battlefield clear up (or was found but not identified). As a result his name is remembered on panel 9 of the Menin Gate Memorial in Ieper (Ypres), Belgium. Locally he is remembered on tablet 2 of the Newbury Town War Memorial as well as the memorial board and roll of honour in St Nicolas’ Church. In late 1918 William’s widow Annie remarried – to William’s elder half brother, Frederick whose own wife, Rose, had died the year before leaving him alone to raise five children. It seems they got together to provide a family setting for their nine children; Annie and the children moved to Frederick’s home in Bristol. William’s sister, Louisa Ann, married her cousin, Arthur Coxhead, and settled in Hamstead Marshall - they were the parents of Walter and Aubrey who are remembered on the village war memorial. Another of William’s cousins, Thomas Colbourne, son of his sister Eliza, also served, spending periods at the front with the Wiltshire Regiment, Devonshire Regiment and Labour Corps. He had problems when his wife died; granted two weeks special leave to come home and make arrangements for their seven children he evidently did not the time sufficient and did not return to his unit on the due date. After another week he was declared Absent Without Leave. He was fortunate that this occurred in December 1918 – after the Armistice - he was demobilised on 6 February 1919 seemingly without returning to France and without any punishment for this offence. Thanks to Steve Miller, great grandson of William's half sister Elizabeth, for his input to this story.